Consider system A, consisting of two disks of radius R, with both rotating clockwise. Now consider system B, consisting of one disk of radius R rotating counterclockwise and another disk of radius 2R rotating clockwise. All of the disks have the same mass, and all have the same magnitude of angular velocity. Which system has the greatest angular momentum? This is College Physics Answers with Shaun Dychko. System A consists of two disks of radius r and we'll find the total angular momentum of this system. We have the angular momentum of the first disk plus that of the second disk and we don't need any subscripts one or two here because the disks are identical and so they both have the same moment of inertia. So we'll say two times the moment of inertia multiplied by the negative velocity omega. The moment of inertia of the disk is its mass times its radius squared over two, and so we substitute that in for i. The two's cancel here giving us a final answer for the moment of inertia or sorry, the angular momentum of system A as m r squared omega. 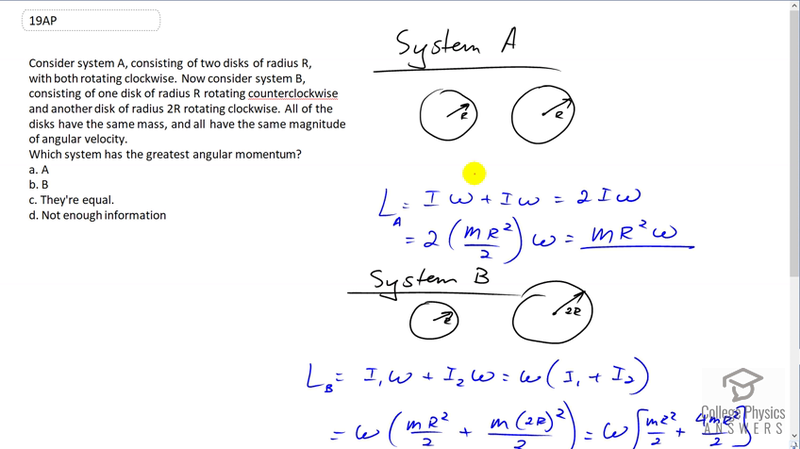 Then we consider system B and it has a disk of radius r and then a second disk of radius two r. So the angular momentum of this system will be the moment of inertia of the first disk multiplied by its angular velocity, plus the moment of inertia of the second disk multiplied by its angular velocity. The angular velocities don't need any subscripts anywhere because we're told that they're always the same, and also the masses are all the same. So, we don't need subscripts for the m's. So we can factor out the omega here and multiply by i one plus i two and then substitute for the moment of inertias here. For the first disk we have m r squared over two just as we did in system A. But for the second disk, we have a radius of twor that we have to substitute in. So that two r squared gives us four m r squared over two. These two terms have the same denominator so that makes five m r squared over two and then we can write it as five over two times m rsquared omega. So we're comparing this with this, and this angular momentum in system B is greater than that by a factor of two and a half, or a factor of five over two. So system B has a greater angular momentum than system A. So the answer is B.